Generally accredited to Gichin Funakoshi (but rumoured to have been created by Sakugawa, an Okinawan karate enthusiast in the 18th century) the Dojo Kun, or dojo rules, serves as a set of five guiding principles, intended to frame the practise within an ethical context. 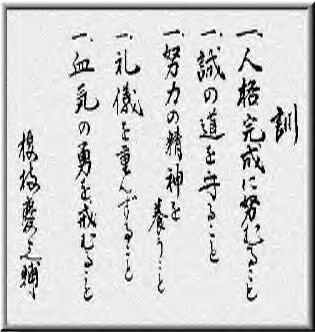 The word Hitotsu means “one” or “first” and is prepended to each rule to place it at the same level of importance as the others. The word koto which ends each rule means “thing” and is used as a conjunction between rules.